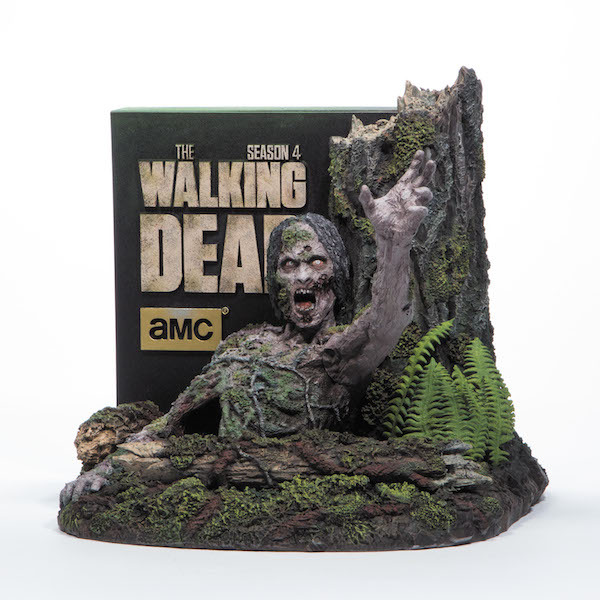 The Walking Dead Season 4 DVD/Blu-ray sets are coming out in a matter of months. We've known that much already. In fact, the box art and special edition packaging were revealed last Spring. But today Anchor Bay Entertainment released some specifics on the Walking Dead Season 4 home video release. That includes the Blu-ray set and digital HD with Ultraviolet. They also released a new trailer teasing the set. While it doesn't offer any direct spoilers from Season 4 -- it's more quick glimpses of carnage and chaos -- it does reveal a key moment that you might not want to see out of context, so keep that in mind before hitting play, if you haven't seen all of Season 4 yet! The fourth season of The Walking Dead picks up with Rick and his group still living in the prison. But when a brutal and highly contagious illness sweeps their population, they're faced with having to care for their own with the limited medical supplies at their disposal. The second half of the season takes a much sharper turn, picking up the pace to what amounts to a series of pretty great episodes and some truly disturbing moments toward the end. We got a look at the above set, which has been available to preorder at AMC's Walking Dead store (for the full suggested retail price). Both the DVD and Blu-ray sets will contain five discs showing the episodes as they were broadcast. The Blu-ray + Digital HD with Ultraviolet present the Season 4 episodes in 1080p HD with Dolby TrueHD 7.1 audio. Bonus features include never-before-seen production footage, deleted scenes and audio commentaries. The announcement also mentions "ultra-exclusive content" only available on the Blu-ray release. Specifics aren't mentioned other than that it includes audio commentaries and "several extended episodes seen for the first time." So we have The Walking Dead: The Complete Fourth Season on Blu-ray (suggested price: $79.99), DVD (SRP: $69.99) and the Limited Edition set ($129.99), all of which will arrive in stores on August 26. Amazon already has them available for pre-order, with the limited edition price currently set at $90.96. While we wait for the Season 4 DVD set to arrive, we also have Season 5 to anticipate. Find out what we know about TWD Season 5 here.